A compact UPS with standby topology, the CyberPower Ecologic EC350G provides battery backup (using simulated sine wave output) and surge protection for desktop computers, workstations, networking devices, and home entertainment systems. 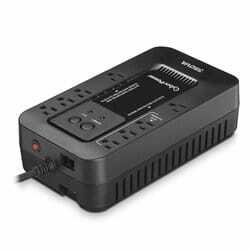 During power interruptions, the EC350G offers reliable power protection and battery backup. When the battery backup detects that the computer is off or in sleep mode, computer peripherals connected to the ECO Mode, surge protected outlets will be automatically turned off, reducing power usage and lowering energy costs—USB connection required. The EC350G comes with a three-year warranty (including coverage of batteries) and a $100,000 Connected Equipment Guarantee. Energy-Saving ECO Mode The Ecologic UPS Series offers energy-conserving ECO Mode functionality and surge protected ECO outlets. These outlets are specifically designed to provide energy and cost saving benefits. It’s easy to use the ECO Mode technology. Activate the ECO outlets by pressing the ECO Mode button on the front of the UPS. When ECO Mode is turned on (and the computer is properly connected to the UPS), the UPS can detect whether the attached computer is turned off or is in sleep mode. The UPS will then safely remove power from the ECO outlets to shut down the connected devices, reducing power usage. ECO outlets provide easy-to-use flexibility. When activated, ECO mode helps reduce energy waste by switching off AC power to connected equipment. (If you need to use the ECO outlets as standard surge-protected outlets, simply turn off ECO Mode.) CyberPower’s ECO Mode outlet technology, combined with ENERGY STAR® compliant GreenPower UPS™ high-efficiency design, increases energy savings, reduces heat dissipation, and provides quiet, eco-friendly power protection.